This worksheet is aimed to forecast sales revenue and variable expenses (cost of sales). First, enter the product and/or service names to free rows on the worksheet. Then enter your forecasts. Click "OK". When forecasting sales, make sure that you have selected the correct input parameter, e.g. "Sales revenue," "Gross margin," etc. Insert sales revenue forecasts for a product or service for selected periods (years, quarters, months). When a yearly sales forecast is entered, iPlanner will automatically calculate the sales revenues for months and quarters "downwards" (by subtracting). And vice versa, when entering sales forecasts for months and quarters, they will automatically be summarized "upwards", whether by quarterly or yearly sales revenues. The software processes other input parameters, which can be summarized by periods, in the same way. (%) Input the gross margin of the product or service (also known as the "gross profit margin" or "gross profit rate"). The gross margin is the difference between the sales and the production costs. Gross margin can be defined as the amount of contribution to the business, after paying for direct costs, required to cover overheads (fixed operating expenses). It expresses the relationship between gross profit and sales revenue. The cost of sales on the income statement is computed by the gross margin. (in days) Insert the average number of days during which customers pay their invoices. The receipts will be recorded accordingly in cash flow projections. This parameter is used to calculate the value of the balance sheet item "Trade receivables" (including for the opening balance sheet, if a plan is made for ongoing business). (in days) Enter the average number of days during which suppliers or vendors are paid. Payments are recorded in the cash flow projection accordingly. This parameter is used to calculate the value of the "Trade creditors" balance sheet item (including in the opening balance sheet, when plans are made for ongoing business). This parameter is relevant, when the gross margin of products is less than 100%, or in other words, if it is for products or services that involve variable expenses. (in days) Enter the average number of days, during which goods or products are in stock. In other words, the expected sale of stock in days (inventory days). Accordingly, the purchase of goods (restocking), as well as payments for purchased products is predicted automatically. The value of the balance sheet item named "Inventories" (including in the opened balance sheet, when plans are made for ongoing business) will be calculated on the basis of this parameter. This parameter is relevant, when a product is declared less than 100% gross margin. (%) Enter the percentage of exports in sales revenue for a product or service. Export sales revenue is recorded under the income statement item "Export sales." The automatic VAT rate set for exported products or services is 0% (if the VAT handling has been turned on). The software provides three different methods for planning sales revenue and the cost of sales. 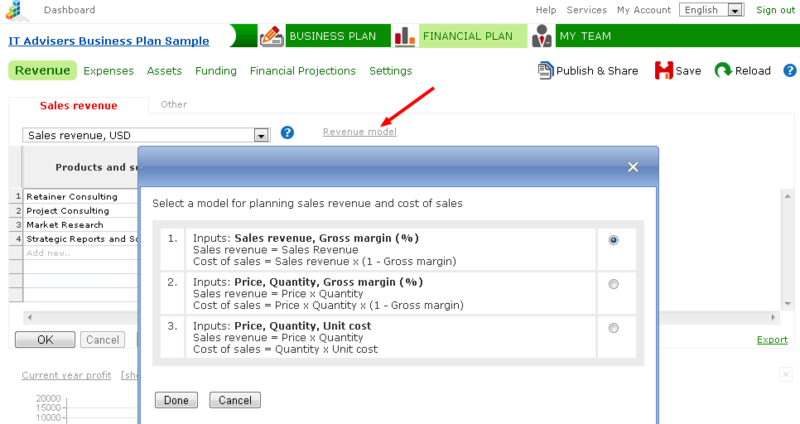 To view and change revenue models, click on the "Revenue model" link. After selecting the suitable revenue model, click "Done". The selected revenue model applies to the whole product/service list. Previously entered forecasts will be stored when the revenue model is changed, i.e. the revenue model can be changed without repeating the inputs. Price Enter the sales price for a product or service for a selected period. Quantity Enter the scheduled sales quantities for a product or service for the period selected. When entering sales quantity per year, iPlanner will calculate the sales quantities for months and quarters "downwards" automatically (by subtracting). And vice versa, when entering quantities by months or quarters, they will be summarized "upwards", as quarterly or yearly sales quantities respectively. Other input parameters are the same as in revenue model no 1. Enter the unit cost for the product or service. Unit cost - material cost per unit, labor cost per unit of production, outsourced services per unit, and other unit-related direct costs. NB! The cost estimate for a unit (should be done separately) should contain only the variable cost elements dependent on the production or sales quantities. Other input parameters are the same as in revenue model no. 3.